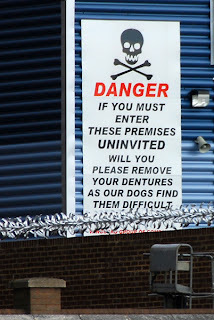 "As our dogs find them difficult...."
I hate it when the camera's zipped up in the bag and by the time I've got it out, turned it on and shot from a moving vessel, the subject matter has been obscured by a hedge with a really mean man-proof fence. Everyone else hates it when I waste their time showing photographs with stories that don't make sense. What's not to get. The photo says it all. What a keen sense of observation you have!